Liv On Tablets are the effective proprietary medicine containing di8fferent types of herbs, which alleviate aggravated pita. These tablets enhance appetite so they are indicated in indigestion, loss of appetite, jaundice and other liver disorders. 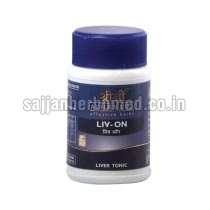 We are one of the prominent Suppliers of Liv On Tablets. We have a vast distributed network that allows us to deliver retail as well as bulk orders for Liv On Tablets within the committed time frame. Ingredients : Bhumyamalaki, Katuki, Bhunimba, Sharapunkha, Patola, Punarnava, Chitraka, Guduchi, Nimba, Yashtimadhu, Dhanyaka, Bhringaraj, Methika, Musta, Vidanga, Vacha. Adults : Two Tablets thrice a day with water before meals. Children : One Tablet thrice a day with water before meals.